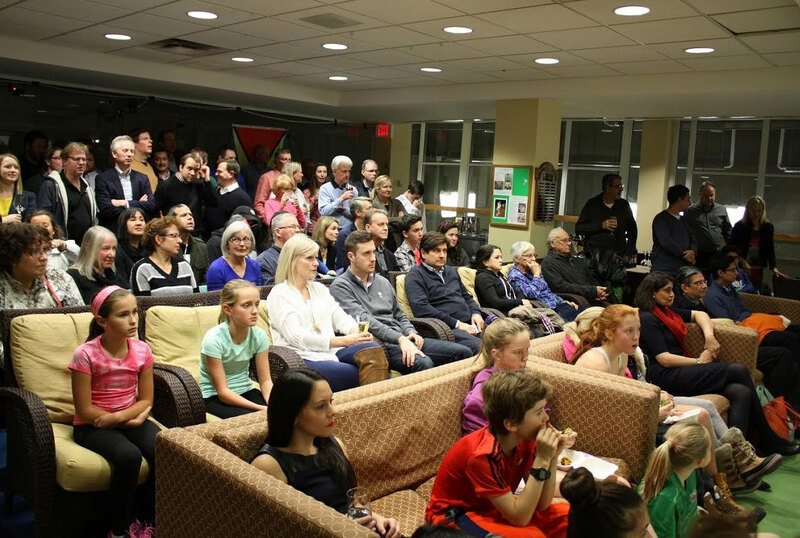 This evening the crowd was packed and the atmosphere was electric. There were loud fans for both players, which is always exciting. 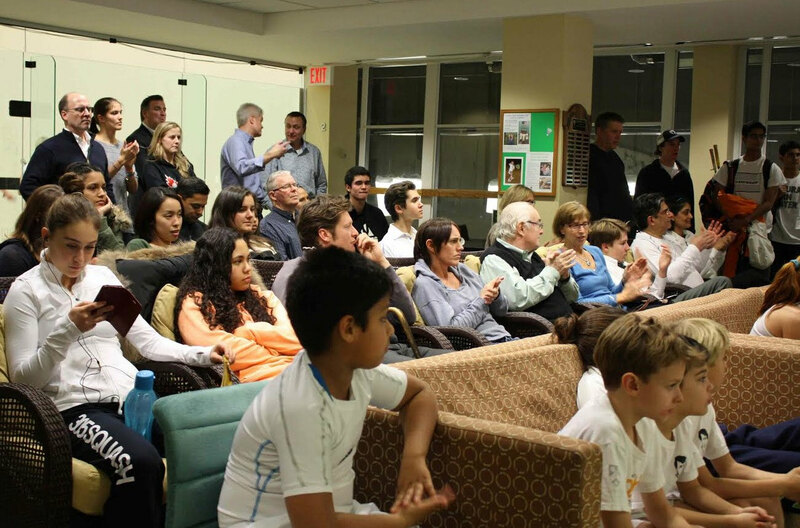 The members were gearing up for the “Around the World” squash section party as they watched the match. The match began with the points going back and forth, with Lust looking relaxed and Fernandes looking nervous and possibly feeling her previous matches. The English woman pulled ahead midway through the first and from there she never looked back. Lust won in three comfortable games, although as she said, she can never ever count out the tenacious Fernandes. Throughout the match, Lust looked so comfortable putting the ball in short and using lots of variation and deception. Fernandes looked the opposite, hitting errors and then resorting to length to try to fight back into the match. She did fight, and in the third it looked as though Lust had been pulled off her stride after a Nicolette injury break to clean up some blood. This only lasted about 3 points before the Englishwoman started slotting in her shots again and cleaned up to take the match. 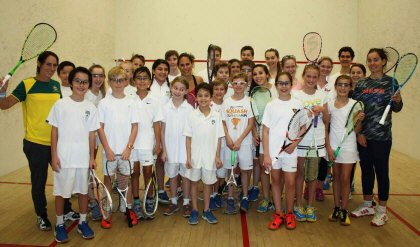 Semi-Finals day started off with the pros playing with our top Granite juniors. The kids loved it and I really appreciate the pros taking the time to help inspire the kids this way. Lots of smiles on court today! Thank you so much to Jen Duncalf, Rachael Grinham, Nouran El Torky, Hollie Naughton, Olivia Blatchford and Samantha Teran. The first Semi-Final matchup of the night was between the number #42 ranked Fiona Moverley versus the #21 ranked Victoria Lust, both from England. 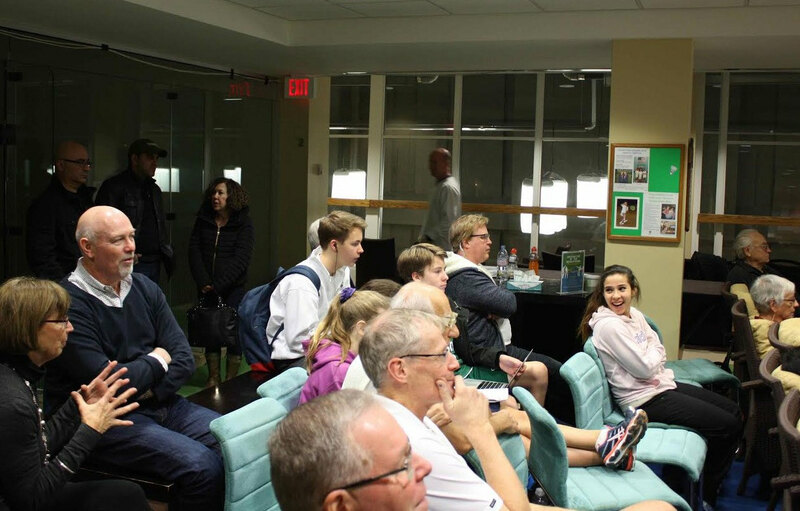 Fiona has been having a fantastic run in this Granite tournament, as she previously beat the number one seed in the tournament. 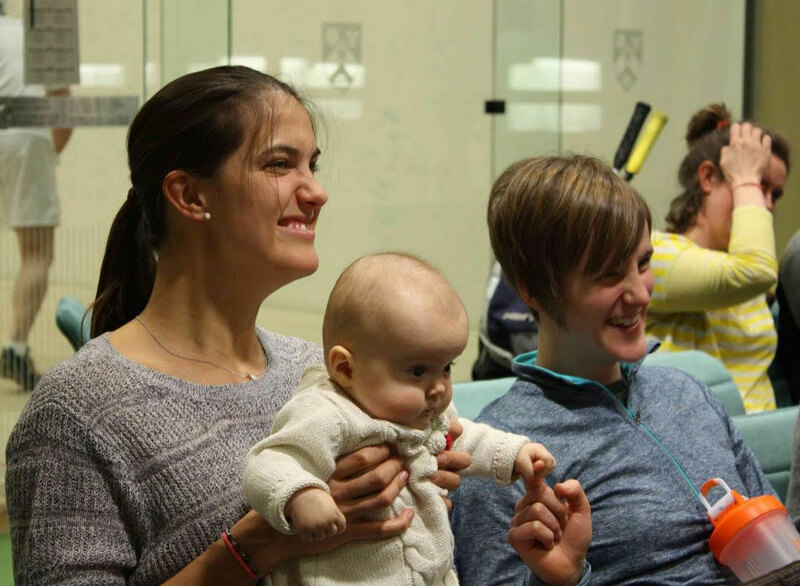 Victoria on the other hand, was playing consistent squash and moved her way into this round of four fantastic players. It was bound to be a fantastic match. The first game was clearly being dominated by Fiona. She took an early lead and stuck with it throughout the match, the rallies were long, but Fiona was always able to close out each point, 11-5 (Fiona). The second game was tightly contested, both players were fighting for control over the game. Several calls were changing the course of the game, but in the end Victoria was able to pull it out, 11-7. In the beginning some loose shots by Victoria gave Fiona a strong start. 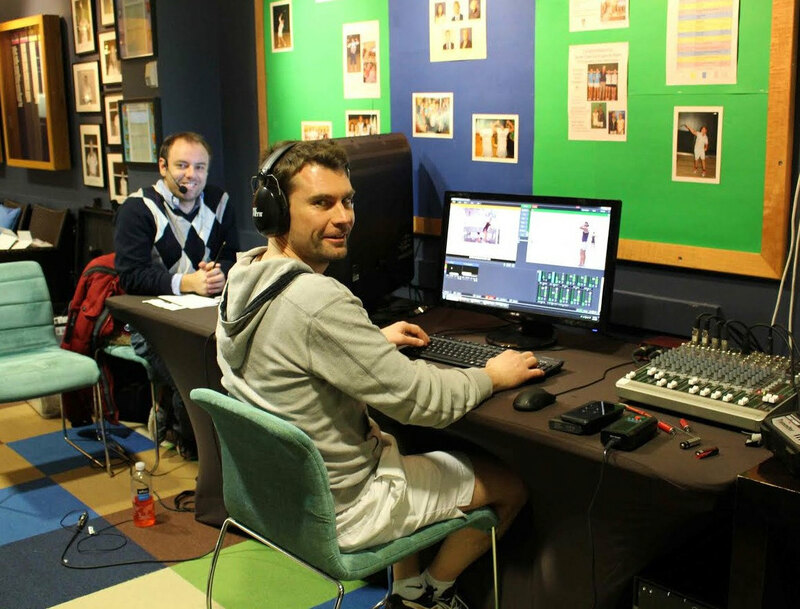 The general level of play was fantastic, and the crowd was providing support for both players. Long rallies clearly diminished the energy from both players throughout the match. Victoria has been playing much better since the first game and has had more control over each rally. Victoria won the third game, 11-9, making it 2-1 Victoria. In the fourth game Victoria took a very powerful lead, 9-3. Fiona began to rally back going on a run of her own, making it 9-8. This wasn't enough though as Victoria was able to win the game 11-8, and the match 3-1. Victoria: "Happy to win! I thought Fi played really well, got crushed in the first game. I managed to pull myself together and pull through, just as my billet Alex walked through the door! I'm really happy to be in the final, looking forward to it." Pallikal had game ball in the first but relinquished it to Fernandes's great counter drops and cross court kills, aided by a few Pallikal errors. The second saw a brief blood break after a trademark dive from Fernandes. Pallikal was a bit ahead until Fernandes fought back to tie it 7-7, 8-8, after the break. Another epic Fernandes counter drop put her 9-8 up, and then Pallikal fought back with a beauty kill, moving Fernandes side to side. A long rally and a crosscourt that stretched Pallikal too far for the attack she tried to play and it was game Fernandes. 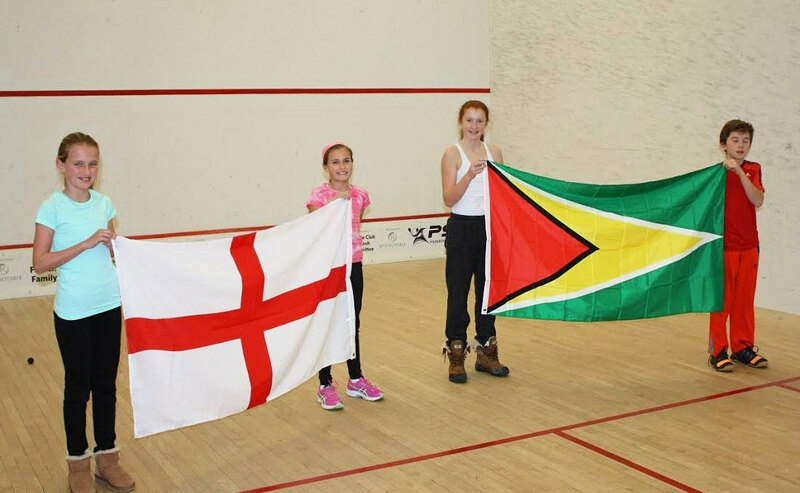 Really well battled by the Guyanese. The third game was a great battle of the two players trying to reverse the pressure onto one another. It was do or die for the Indian player. Great attacking play by both. Pallikal spiced it up trying some balls down the middle to put the quick Fernandes off her stride, very entertaining! Pallikal made an error at a very long and important rally, and put it to 8-5 Fernandes. But she turned around the next point and wrong footed her opponent with a great cross kill. Pallikal played really well and smart to pull it back to even, and then we witnessed a massive rally ending in a let that was really hard work for both players, especially Fernandes. Steph Edmison is here beside me and she says Fernandes is a machine! 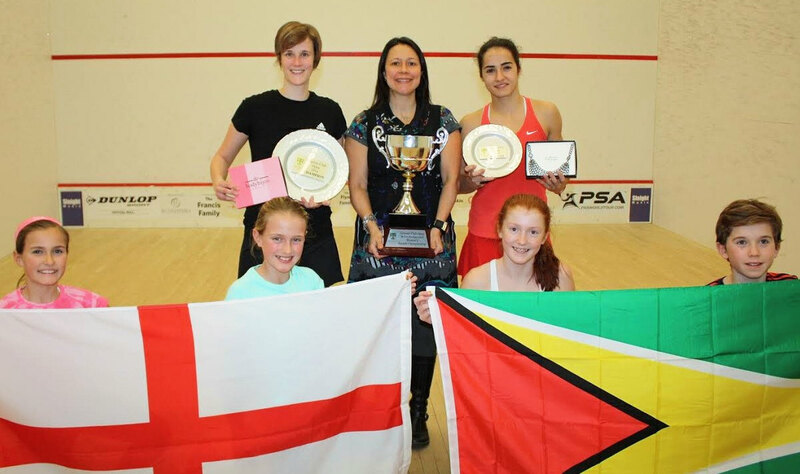 From there, no one knew who would win the game, but it was Nicolette who got the first chance to take it, and Pallikal handed her a place in the final with a trickle boast error. Fernandes stretched her too many times and it paid off. 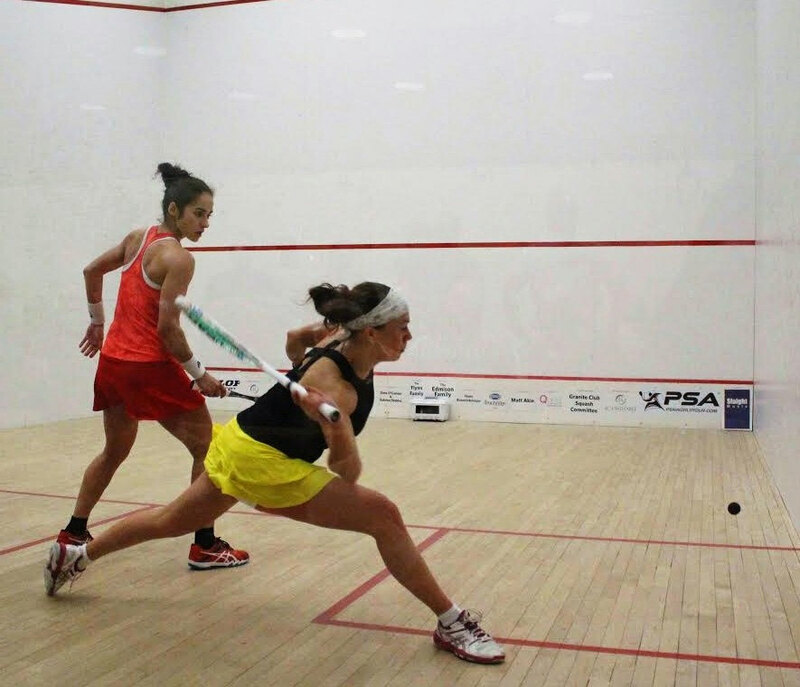 Nicolette: "I just thought that was a beautiful, clean game of squash. We train so hard to play games like that. 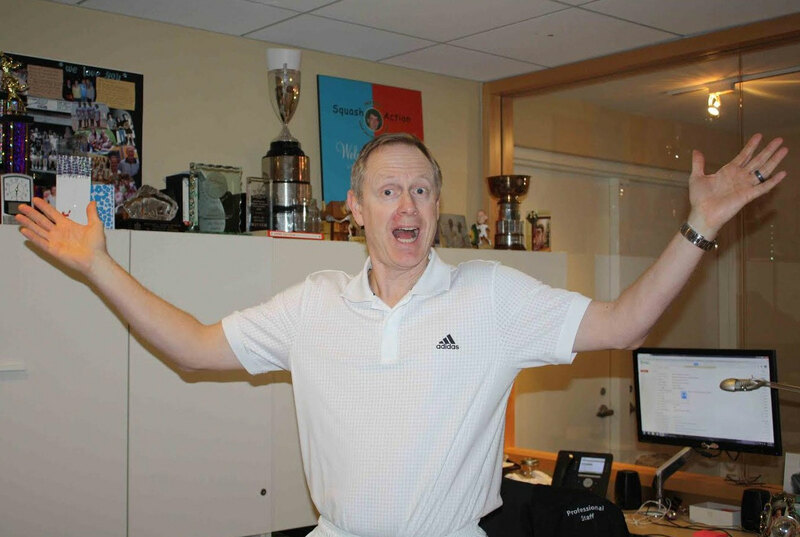 Squash prevailed, you know. I was just happy that I played well. Regroup and start again tomorrow." After being beat 3-0 just last week by her opponent tonight, Moverley was looking to start this match on the right foot. Winning the first with lots of volleys and boasts that wrong footed Teran, she looked to be on her way. Game two was a different story, and a long affair. The two hit the ball at a similar pace. Moverley varied the pace more often than Teran but got sucked in to the hard hitting too much and Teran thrived. Some long rallies at the end of the second game served Samantha well. It took her a couple tries to close it out, but the second was hers in the end. The third game started with a nick deep in the court from Teran, but then Moverley raced to 10-2 with clever play, great boasts, and a hold or two. Teran was looking to take the ball early and hit it hard, while Moverley appeared to be looking to twist and turn the Mexican. 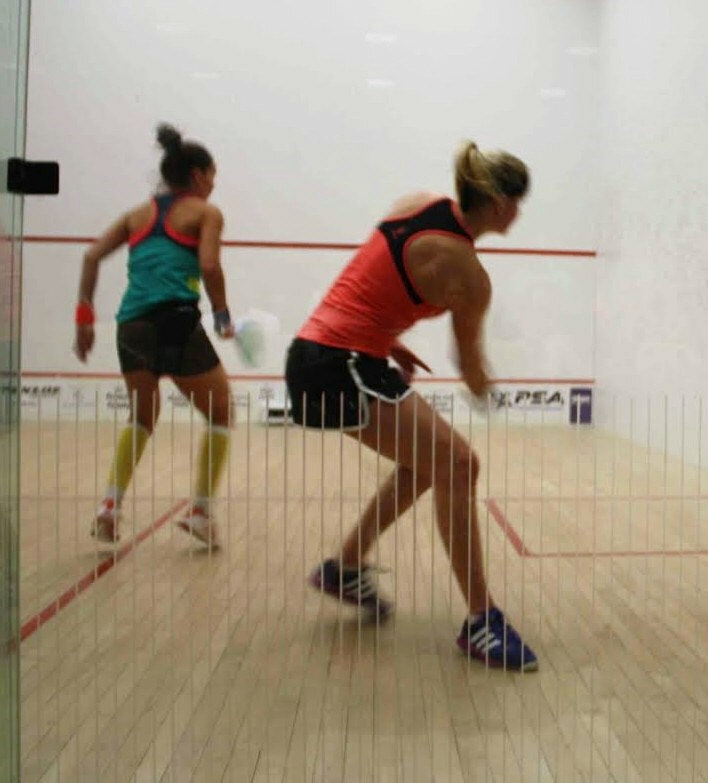 Teran worked hard to try to stay in the game but she couldn't stretch the tall English woman far enough and Moverley slotted in a beautiful back hand straight drop from high overhead to take game 3. The players exchanged points for the first half of the fourth game, with both working hard but making a couple errors each. At 4-3 up Teran played a beautiful straight drop to pull slightly ahead, but then Moverley put two great rallies together including one irretrievable straight drive to even out. Then Teran really started to play her tight straight drops, which had been missing for the most part up until then. Teran worked incredibly hard and pulled the fourth her way. The decider started the same way as the end of the fourth, with Teran's quick straight drops, but Fiona has a few of those in her pocket too! She also put in a wicked overhead backhand crosscourt nick. Moverley pushed ahead to 6-2 but you can't count Teran out, ever. There was a monster rally that had Moverley bending over at 7-3 to the English woman, and it went Teran's way. Then, up 8-4, after a couple lets, Moverley put a great tickle boast opportunity into the tin after Teran worked sooooooo hard. Another Moverley tin. Teran is holding Moverley very well, knowing she can't give up a point. At 8-7 there were a few lets, and one monster rally. Moverley went up to 9-7 with a wicked straight forehand drop. Then an epic, well played rally by Moverley but she finished in an easy tin. 9-8 Moverley. A no let for Teran on a great short ball by Moverley, then an error from Moverley. 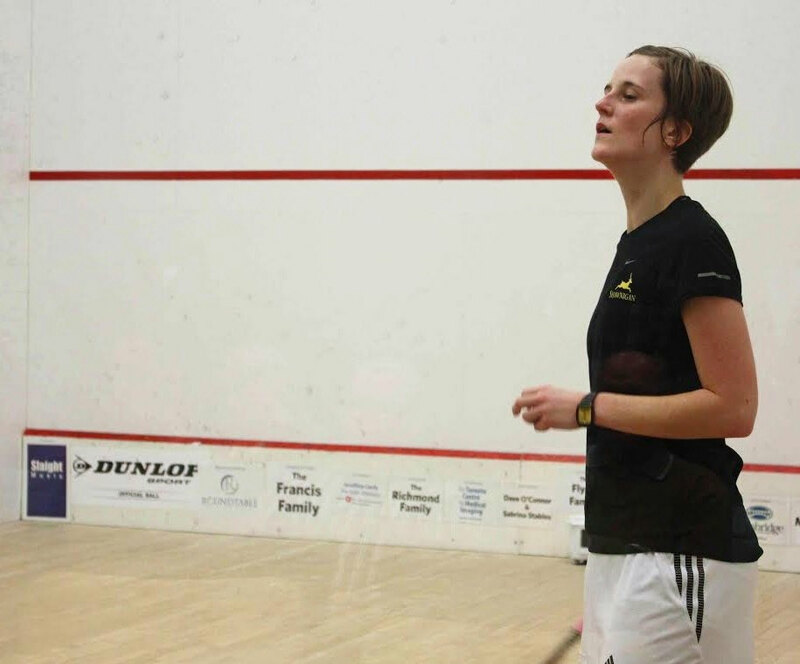 Teran was fighting for her life, but with a back court nick Fiona Moverley clinched her place in the semi finals. 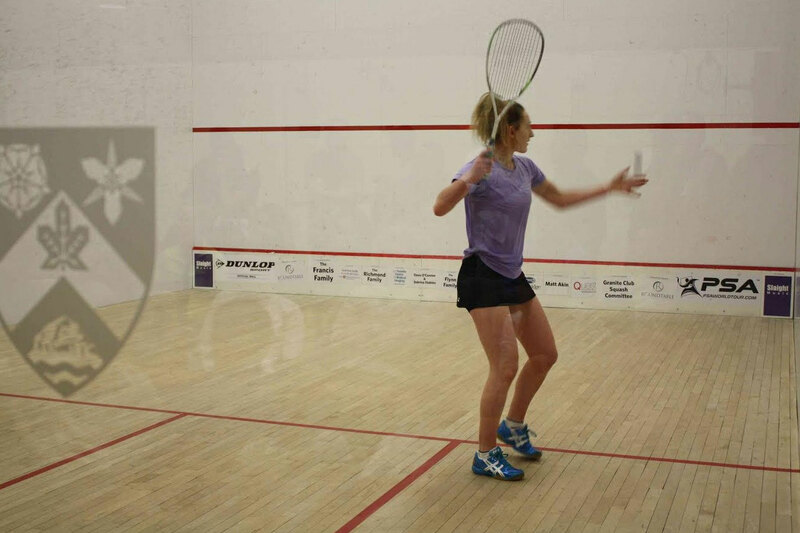 Fiona: "Delighted to be in the semi finals. I knew tonight's match was going to be tough and long because of her athleticism. It's not easy to win a rally when the ball keeps coming back! But I stuck to my game plan and mentally stayed strong throughout the match to finally see out the fifth. Can't wait to play again tomorrow." Deon started the match off playing so smart as she took the first two games 11/8, 11/9. Nicolette pulled one back, taking the third 11/7. Game 4 started with a tight boast from Deon, causing Nicolette to lose her balance, maybe a bit shaken up. Both players hitting really deep length and then finding the volley or short ball to attack for a winner. A few mistakes from Deon, and Nicolette takes a three point lead. 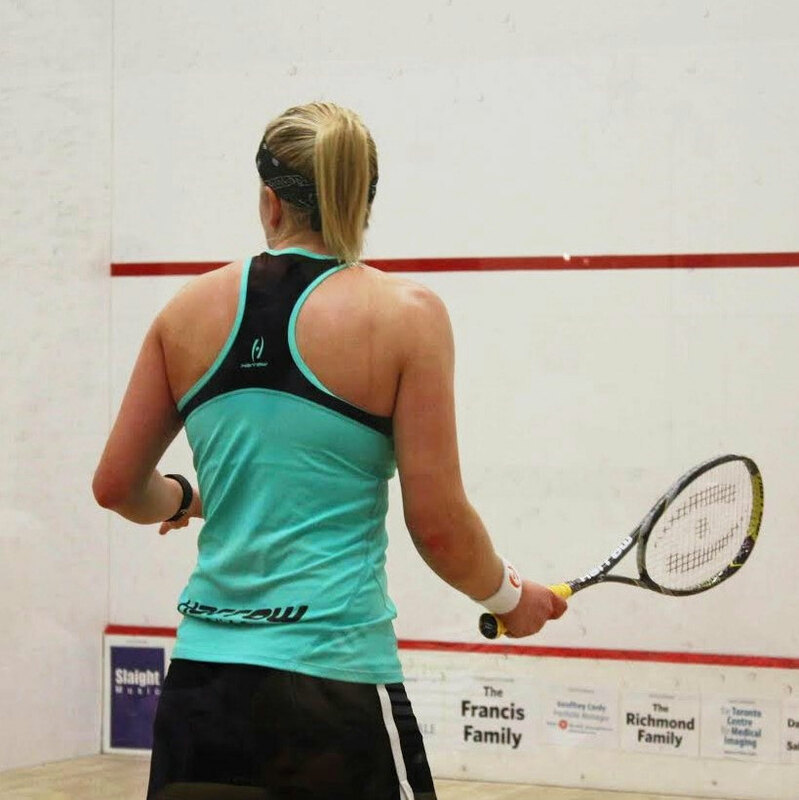 A few more rallies of Nicolette really putting the pressure on and she goes up 6-2. Second cross court nick off the serve from Deon, trying to close the gap. Nicolette takes the open opportunity for a backhand volley drop to give herself game ball and closes with a beautiful forehand drop. Making the match 2-2. We have ourselves a match ladies and gentleman. The final game starts off with an unforced error from Deon followed by a stroke in Nicolette's favour. Nicolette takes a 4-0 lead. Deon uses her length to set up a hard low cross, and then a beautiful cross court nick to close the gap 2-4 and then follows it up forcing a stroke against Nicolette. Deon takes the lead 5-4 with a perfect counter drop and then perfect cross court length to the back left. Nicolette hits a loose ball for a controversial stroke at 7-7 giving Deon the lead again. And Deon gives herself a two point lead with an unbelievable counter drop in the front right, causing Nicolette to dive for a second time, but unable to recover. Some amazing retrieving from Deon, but not quite enough and Nicolette is able to tie it back up 9-9. 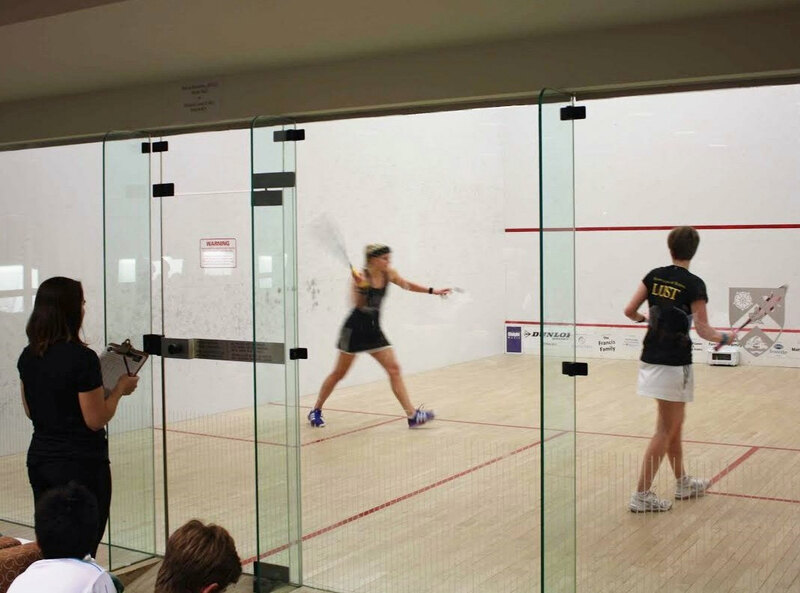 A low hard cross and Nicolette takes the match 11-9 in the fifth! Nicolette: "I almost feel like I didn't deserve to win that. Deon played so well and it took everything in me to just kinda regain my focus after the first two, 'cause I felt completely outplayed. The last three games I just thought that I guts'd it out really. Especially the fifth...it was so close, up to 9-9. I'm about 90% happy I won that and 10% sad for Deon because she's my friend." Salma shot the lights out in the first game, going for it from everywhere, and making them. Especially effective on the backhand side. She leads the first game. 10-8, game ball. 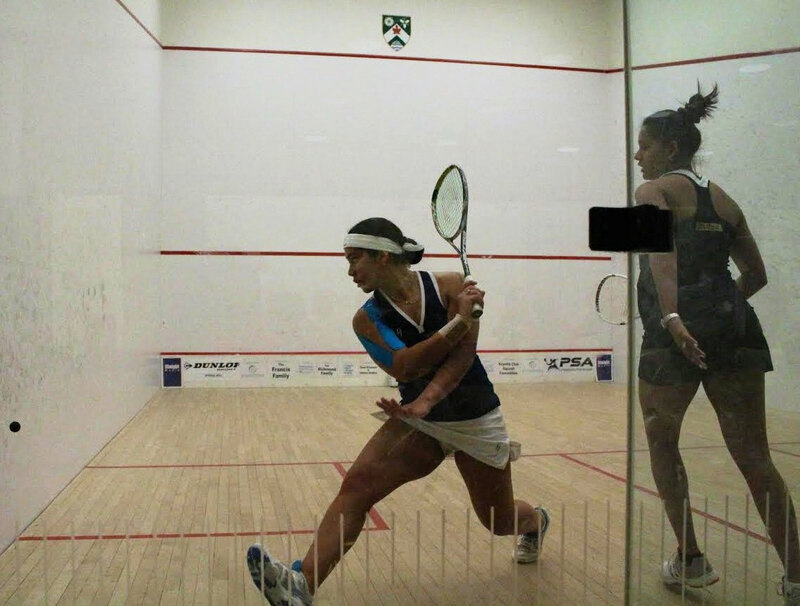 Dipika used her forehand drop as a weapon to tie the first game at 10-10. And a perfect backhand length gives Dipika game ball 11-10 and another forehand drop winner gives her the first game 12-10. Dipika takes an early lead in the second with some unbelievable gets in the front left and beautiful counter drops. Dipika's forehand boast and drop puts Salma under too much pressure and gives her an 8-2 lead in the second. Salma looking a bit frustrated here, and gives Dipika a couple unforced errors to give her game ball. And a great cross court length from Dipika secures her game 2. The third starts off pretty even, with a few errors from Dipika, but then followed by perfect length and a few perfect boasts, she takes a 6-3 lead. Salma popping up a few loose balls to Dipika gives her an opportunity to take it in short, and she uses it for a quick few points and finds herself 10-4 match ball up. And a cross court down the middle gives Dipika the match. 3-0. Dipika: "I knew today was going to be very tough as the last time I played Salma I got chopped in 3. So I knew that today I couldn't give anything away easily. The first was crucial and it was good that I could win that game when I was 10-7 down. I think that helped me get on court with a bit more confidence . 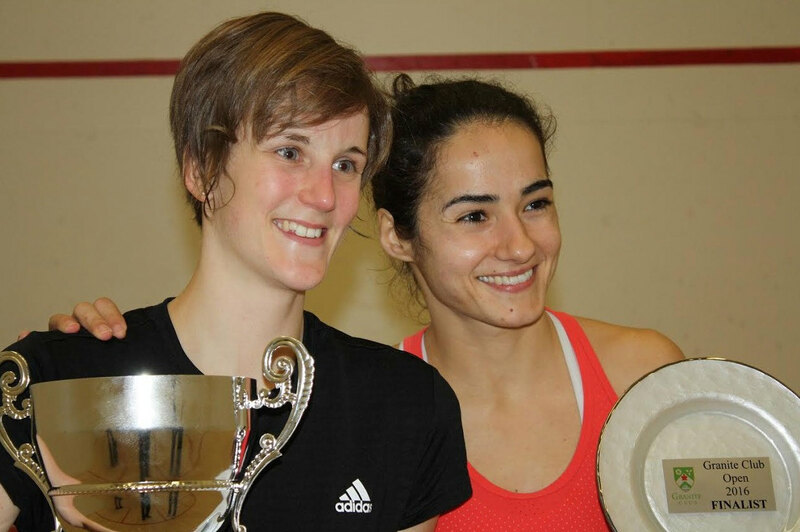 Glad to get through in 3, I know Salma is such a talented player so very pleased :) "
Neck and neck to 4-4 in the first, with some really tight straight work from both players. Lust inched ahead from a Blatchford crosscourt drop error and kept the lead right through. 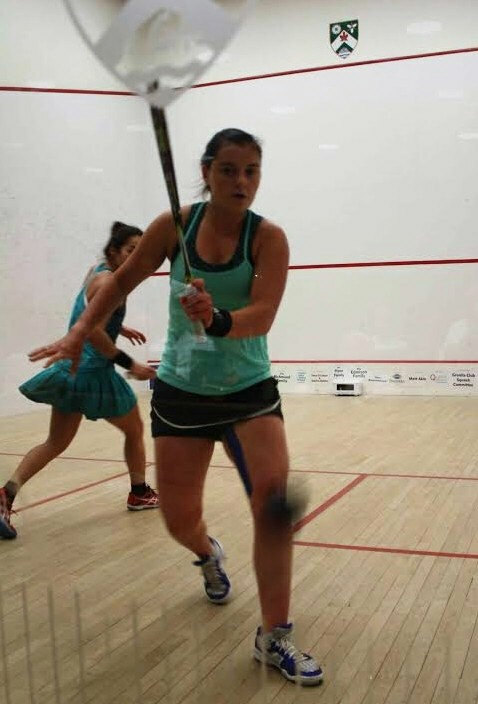 Her straight drives were too straight and drops too good for the American; she took the game 11-8, but not before Blatchford put in a clean backhand crosscourt nick. In the second, a lucky pickup into the nick and Lust took an early lead. Her straight drops were on point in this game, perhaps Blatchford's weren't; a lot of of the the English woman's winners were counter drops. At 8-6 down, Blatchford closed the gap with flair on a great straight drop into the nick, but Lust still stormed ahead to game ball. 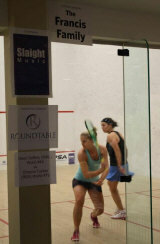 Blatchford handed it to her with an unforced error, a crosscourt out of court. Again in the third Lust pulled away to a 4-1 lead. She is looking confident and taking the ball in short often. There was some controversy through this match and a call that Blatchford didn't like seemed to shake her. Lust carries on to lead 7-1 thanks to good play and a few errors from the American. Lust didn't hesitate to take the match and looks fresh and ready for the semi finals. 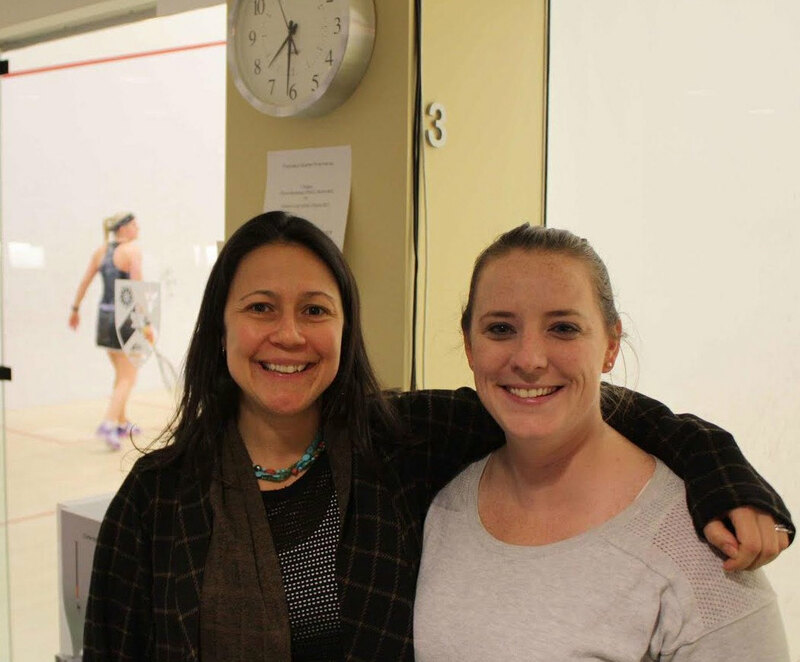 The first round of the $25k Granite Open saw eight matches played out one after the other on the club's show court, and two big upsets as Fiona Moverley beats top seed Jenny Duncalf and qualifier Deon Saffery takes out third seed Rachael Grinham. The two women extended the rallies for the first half of the game, but towards the second half Blatchford stepped up and took the ball in well, looking in charge. The second saw Tomlinson squeeze ahead by two points mid way through the game. Blatchford pulled back to 8-8 with a lot of volleys and some hard work. There was some controversy through the mid-to-later stages of this game and some physical play. Tomlinson came through in the end finishing off 11-8 with a great drop. Tomlinson started off the third with a sharp straight drop, and the tension picked up from there. Quite a few lets ensued. The players struggled to move around each other on the T. Tomlinson put together a combination of great retrieving and good attack to move ahead 9-3 and then 10-4. Blatchford saved 3 match balls, but overall went short too soon and finished the game with a tin from behind. In the fourth, Blatchford gave a few errors and put Tomlinson up 4-2 but then pulled away to 7-5 with good front court play. At 8-8 there was a no let given on a straight drive and Blatchford went up 9-8. Then a great straight drop off a loose attack from Tomlinson gave the American game ball. 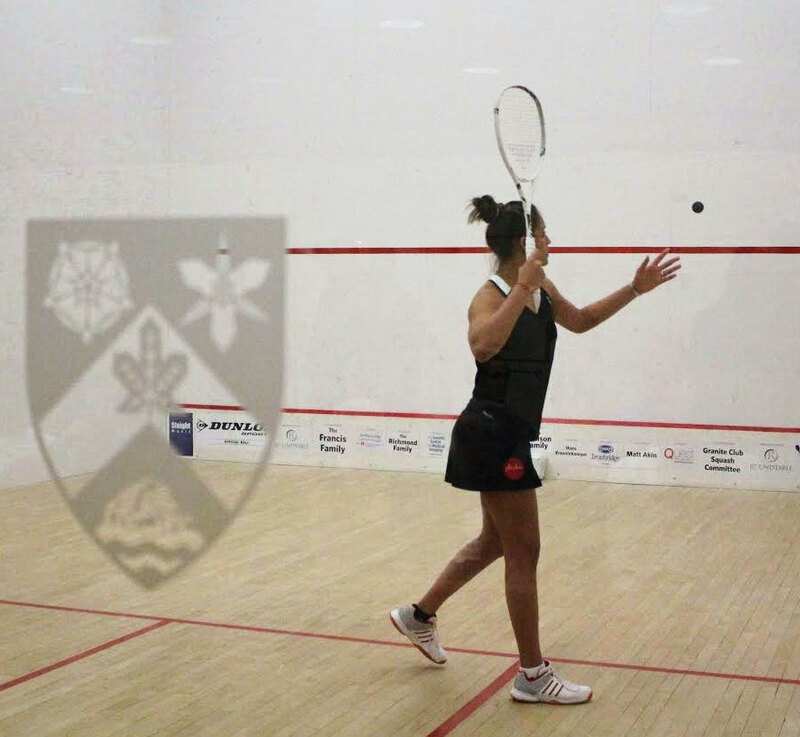 It wasn't to be on the first attempt as Tomlinson kept the ball wide out of her opponent's reach, but after many decisions by the referee, Blatchford pulled through 13-11. To a decider then! The fifth game started at the 60 minute mark. Blatchford made quick work of the game, stretching Tomlinson from deep in the back corners and then putting in some great short stuff, right up to 8-1. Tomlinson pulled three points back but it was too late - match to Blatchford. Olivia: "Just happy to live to see another day. Mille is a fighter and the match was always going to a brutal battle. To fight through a match like that and come out the other side a winner is always a good feeling. 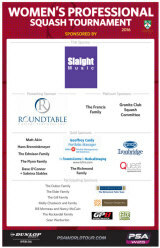 It's wonderful to be back at the Granite Club where Jess and her team take such good care of us!" Both of these women have excellent boasts and put them to use in the first game. The pace was quite high. The score stayed neck and neck right through to 7-7, when Gilis made a couple crucial errors, going too fine, to give Teran the lead. She didn't shy away, put in some good short balls, and pulled back from 9-7 to 9-9 only to hit a loose drive for a stroke. Teran took the next rally and the game on a beauty straight drive. Long, hard rallies started off the second game, with only a few short balls. Mostly boasts. Teran is looking in control and assertive. 11-6, game to Teran. From 4-4 in the third, Gilis put in a great straight drop and a wicked volley to pull ahead 6-4. From there the two players really scrambled to retrieve a lot of balls. Teran looked happy to be running while Gilis looked a bit ragged, but she didn't stop and took the game on her first game ball. The fourth was a battle. It was really impressive from both players. Long hard rallies with quite a few great straight drops and boasts. Teran's experience shone through and she fought to a win. 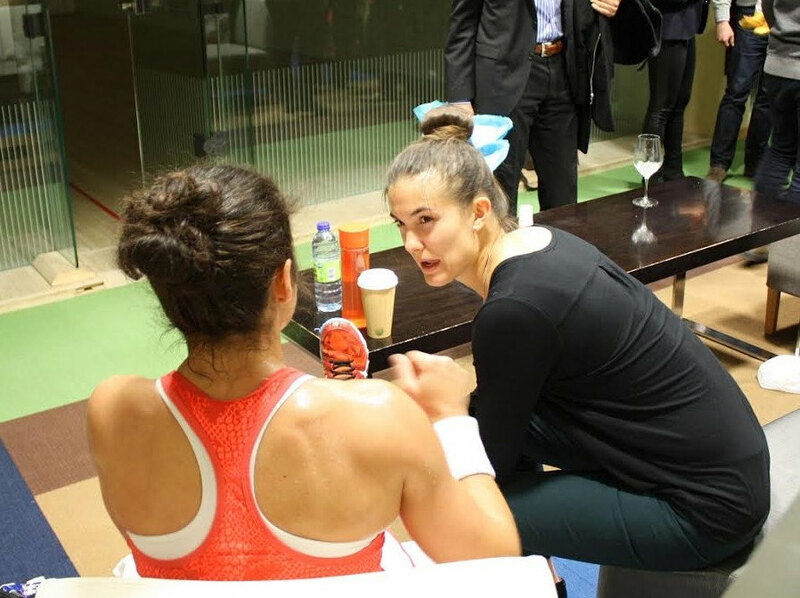 Samantha: "I just happy to win this match, Nele its a very nice player she put me in a lot of pressure but at the end I managed to win, I enjoyed the match even it was very tough from the beginning to the end." First blood to Moverly to go up 2-0 and then Duncalf stepped in for a great straight kill and an inch perfect boast. The two players showed great use of the whole court, but Duncalf did it better up to 7-4 when the two exchanged a few points. Duncalf hit her length with great weight, whereas in the previous two matches players were struggling to get it right. Moverly hit some great boasts through the game and used one of them to hold off a game ball, but couldn't handle Duncalf's excellent shot width and length in game #1. The second started off similarly; great boasts and great retrieval. The quality of shots is very high. Fiona found good length in this game. Fiona hit a cracker of a straight drive to take a mid game lead, 5-4. A couple more good drives took her to 7-4. Then Duncalf turned around and did the exact same thing, hitting beautiful drives to move ahead to 8-7. After that it was Fiona who played steady to finish the game. The first rally of the third game was a marathon for Fiona, who lost out on a stroke but she wasn't phased. She shot away to 4-1 after that. Jenny snuck in a reverse boast winner, and from there the girls traded points the rest of the game. At 8-7 to Duncalf, Moverly made an easy error off the serve, which I thought would be critical, but that didn't stop her. She played fiercely and steadily as they traded points up to 10-10, and then Moverly took the game. 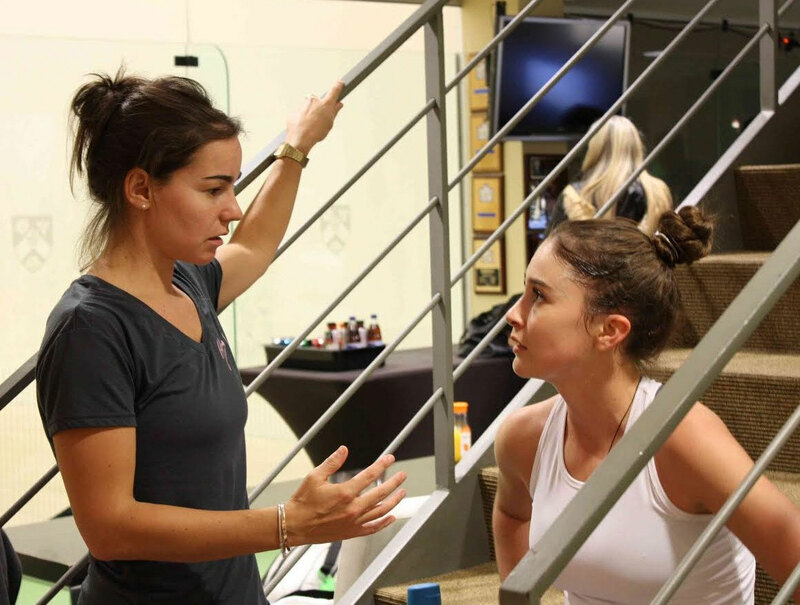 In the fourth, they were neck and neck to 4-4, and Duncalf started to twist and turn her opponent to surge ahead to 7-4. A sweet boast out of the back into the nick and Moverly was back on it. Soooooo close right up to 10-9 when Moverly hit a great drive that Duncalf couldn't return. Match to Moverly! Fiona: "Over the moon to have won that match...even though I believed I could win and went on feeling positive, it's always hard to convert that into a win. She punished anything loose and I had to fight in some of the big points especially when I was down in a couple of the games. So I'm pleased with the way I stuck in until the end. Can't wait for the next match tomorrow against Sam, we only played last week and I'm looking for my revenge!" Saffery snuck the first three points with the help of a couple Grinham errors. After that the two played the whole court beautifully, especially the front. Saffery pulled ahead 8-6. A really tight straight drive took her to 9. Grinham played a couple beauties to keep in. But Saffery's quality was too high at the end of game 1 and she hit a tight length and a tight drop to take the game. Saffery led the first half of the second game, then Grinham pulled ahead mid game. A sweet cross court drive winner and straight drop winner put Saffery ahead 9-7 and she didn't hesitate to crunch a crosscourt winner out of the front to get to game ball. Grinham put in a gorgeous forehand volley drop to get one point back but the next thriller of a rally went to Saffery to take the game. These two were not hesitating to go to the front and you could tell they were loving it. Again the third started with a lot of play at the front of the court. The two play with great deception so it's fun to watch. Grinham was quick onto the balls, but made a few unforced errors. Saffery used height to stretch Grinham. At 7-5 to Saffery after an error from Grinham, the Australian put in some perfect short shots. Saffery made an error and played a bit looser at the end of the game, and Grinham took advantage of that to win the game. The fourth - I had to stop writing to watch. Great front court work from both but Saffery stayed steadier. She pulled it out for the second upset of the night. Deon: "Rach is always a tough one to play, you never have any idea where the ball is going so you just have to get ready to run. Happy with how I played overall. Bring on tomorrow, but first I have to change my flight as I'm meant to be leaving tomorrow for my Nationals in Wales! Whoops"
Kobayashi played with great touch for the start of the game but then Lust pulled ahead to 9-7 and then 10-7 with a beauty heavy drop off a loose ball from Kobayashi. She finished the game off on her first opportunity. The start of the second saw the two players battling with lots of long hard length, which surely is to Lust's strength. Kobayashi made a couple errors trying to go in too fine. Lust rushed to a 4-0 lead before Kobayashi scored her first point with a great boast, a signature shot of hers. At 5-2 to Lust, Kobayashi put together a great rally to get a point, but followed it up with a boast error. She lost the precision in this game that she had in the first. Lust pulled way ahead to 9-4 and then at 10-4 she hit a wicked crosscourt nick off the ground from behind her. Lust takes the game on a Kobayashi error. Lust played well to start the third, stretching Kobayashi to the back especially. An error from Lust on a loose ball put Kobayashi ahead by one point early in the game, but then it went back and fourth, until it was Kobayashi's turn to take the lead with two beautiful drops. 6-4. Stroke, 7-4. Kobayashi made a drop too fine and gave Lust an error at 8-5 up. Then Lust held a great crosscourt kill to keep her in but it wasn't enough. 11-8 Game to Kobayashi. The fourth saw Lust storm away with the match, playing excellent straight drops while Kobayashi fell back against the onslaught. Victoria: "Happy to win there. Misaki and I have played a lot, since we were juniors. It's always going to be a tough match and I'm happy I won in 4. Misaki played very well." This match shows a great disparity between the two rankings, but El Torky at #61 did not look afraid to put up a fight. Pallikal, world #17, took the first with confidence, 11-4, but then in the second, El Torky put herself up to an early lead, 3-0. From there she played aggressively, with no fear, to take the second game. The third was over in a flash, with Pallikal racing to an 8-1 lead before El Torky snuck her second point of the game. That was it though, as Pallikal played some great shots to take back the game and the lead. The pace of this match is very slow with a lot of time between points, and quite a few lets. We saw more calls from the ref in the fourth game, when the line the two players took to and from the ball seemed to clash. El Torky put in a good fight but Pallikal's experience and confidence shone as she finished off the match with some great front court play. 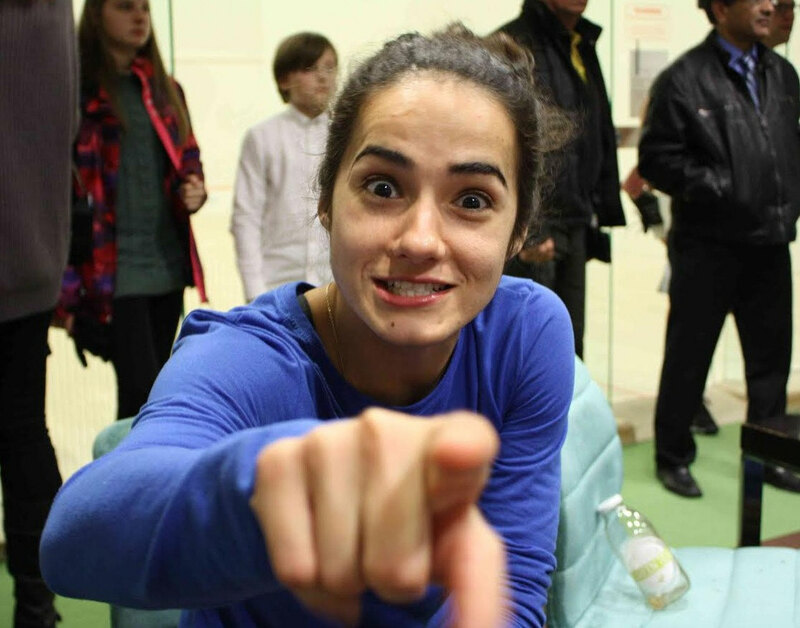 Dipika: "I've played Nouran all through my Junior career and I knew what to expect. We played 2 years back in India and i got the better of her then. I knew she would come out with all her winners today so I needed to keep my basics going. My aim was to try and get the first 4 points of every game so I could relax a bit towards the end. Love playing in the Granite open, last year I lost in the finals so I've come back this year to try and win the title." 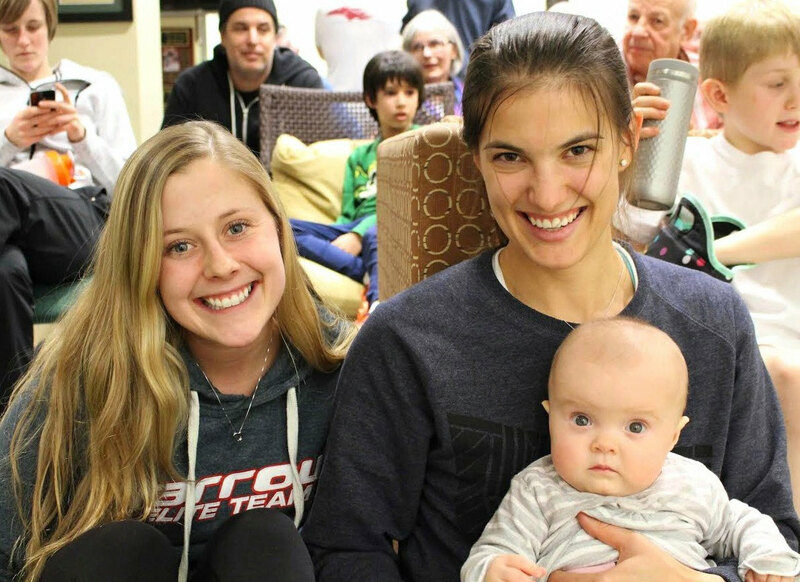 The crowd got loud right from the start, cheering on their favourite, Canadian Nikki Todd. The Granite squash pro fed off of the energy and played great squash to bounce to a 2-1 lead, looking confident, fast, and ready to battle with Ibrahim. Todd pushed ahead by slotting in some sweet winners in the fourth game; match ball, with a few to spare, and the partisan crowd was ready to give her a standing ovation. Ibrahim wasn't thinking along those lines. She dug in her heels and took the fourth, forcing a decider, and from there she didn't look back. She looked much more confident in the fifth and though it was close, she always stayed ahead. Short write up as I couldn't help but just watch! Salma: "Nikki played really really good, and I was really surprised with how she played and I kept telling myself to just do my best. I told myself to stay in there and I'm glad to live another day. The crowd was against me but I'm glad I pushed myself through to win. 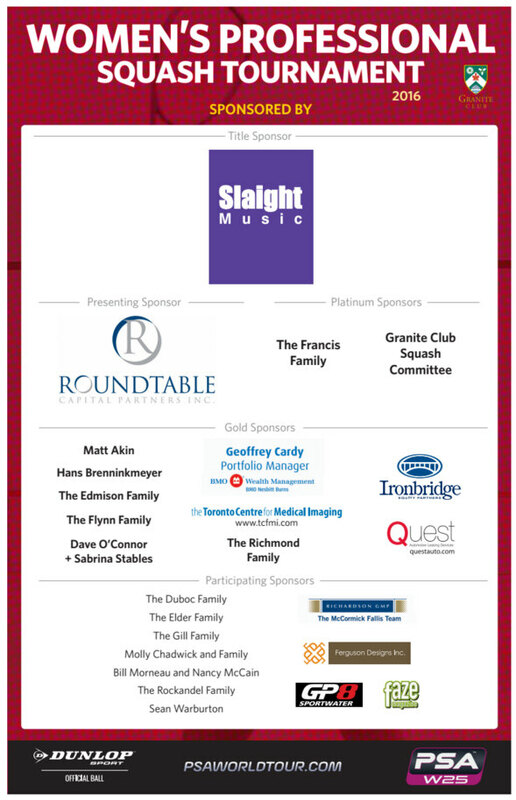 Just looking forward to tomorrow." A battle in the first and third games, and quite a long match considering a quick second. The two women play a similar game, very physical and quick. In general, Fernandes played very steady, while Landers-Murphy made too many errors. The crowd that stuck to the end at 10:45pm thought we were headed to a fourth a few times when Landers-Murphy fought to get multiple game balls, but it wasn't to be this evening. The players made it easy for this referee, there were very few calls! Nicolette: "I played her in October and it was a hell of a lot harder today. The first and the third could have gone either way. So I feel very lucky to come off in three with a win." she lost tonight but she's #1 in our hearts! 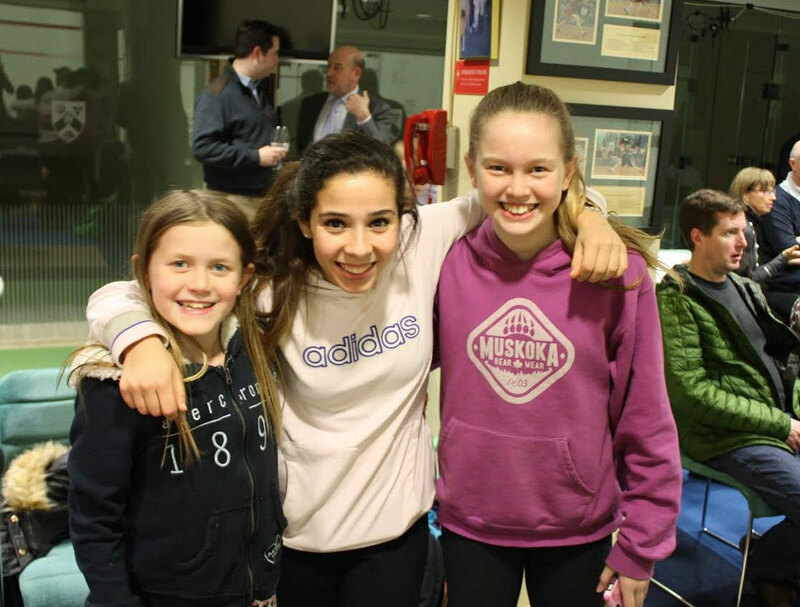 A single round of qualifying matches at the Granite Club saw both local players lose out as Millie Tomlinson, Nouran El Torky, Deon Saffery and Nele Gilis claimed places in the $25k main draw. The match started out even for the first few points until 3-3 but then Millie pulled away a bit to 5-3, when Hollie hit four unforced errors to let Millie go up 9-5. Millie was on the ball early, with her nice movement in the back left and ended up finishing the game with a terrific backhand drop. In the second game, Hollie came out firing with great length and volleys to get a 3-0 start. But as the game went along, Millie kept steady and tight while Hollie still made a few too many unforced errors. At 9-7 up, Millie rolled a ball out to give her game ball, that Hollie returned into the in. The final game saw Millie take a comfortable lead. Hollie tried hard but couldn't get back into it. 3-0 Millie, 11-5, 11-7, 11-4. 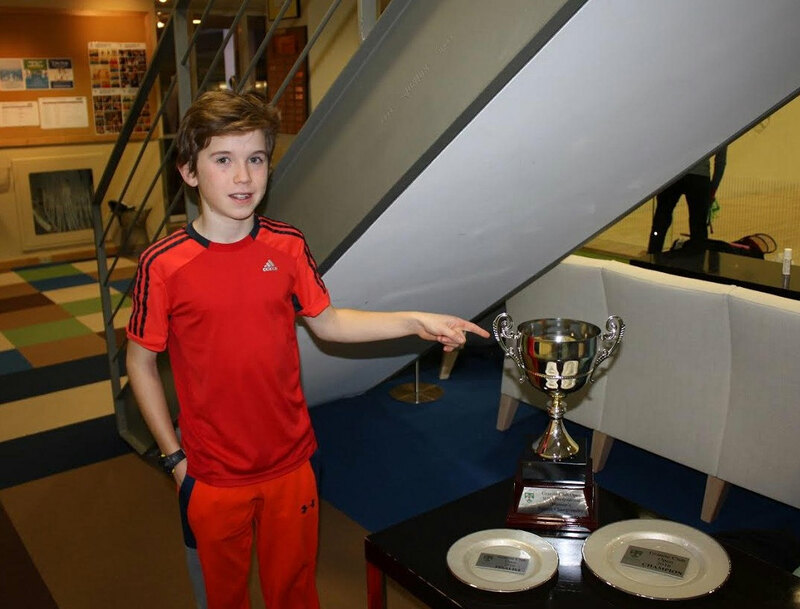 "I was a little nervous at the start of the match as it's my first tournament of the year, but I really enjoyed it. The crowd were great and Hollie played really well. I'm looking forward to tomorrow now", said a smiling Millie after her 32 minute match. This match was far more physical right from the start. Nouran went diving across the court to end up only with a No Let, letting Danielle go up 3-0 in the first. Danielle ended up taking a 9-5 lead in this one, only to have Nouran work her way back to win 6 straight points to take the game. 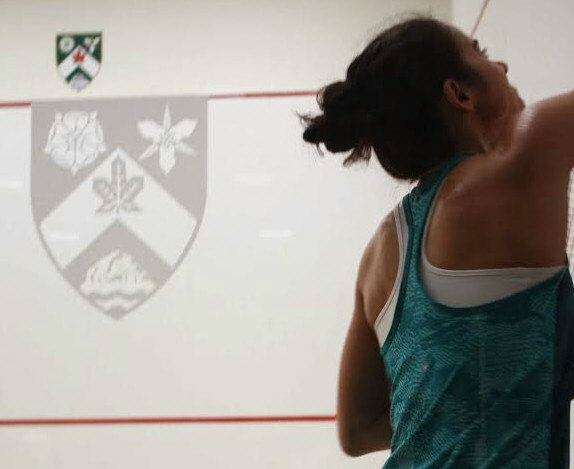 The second game saw a similar pattern with Danielle playing aggressively and accurately to get to 6-0 and 9-5 up, but with Nouran clawing her way back to 9-9. An unforced error by Danielle pushed Nouran to game ball but some terrific gets and two awesome boasts by Danielle helped her to level the match at 1-1. After the girls split the 3rd and 4th games, the fifth was another see saw battle where Nouran squeeked through. 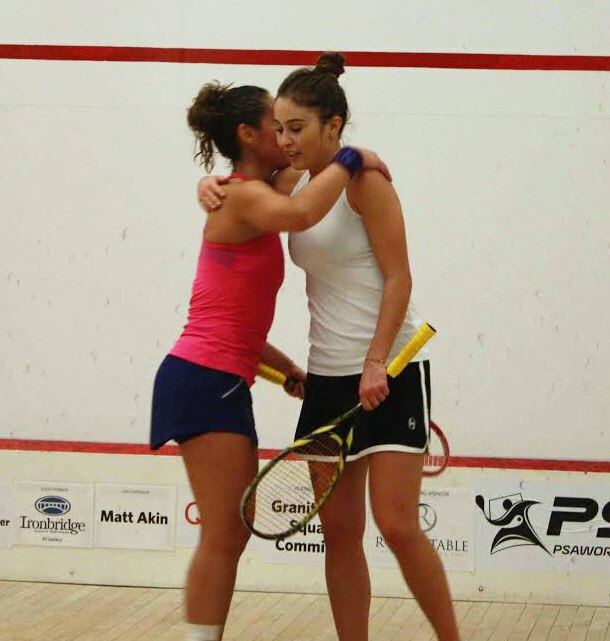 3-2 Nouran, 11-9, 10-12, 11-8, 6-11, 11-8. "At the start I was so nervous. Her focus was really good today. The first two games I started a bit late, but thank god I found a way to take it at the end. 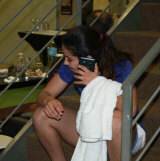 Time to rest for my match tomorrow", said a relieved Nouran after her 55 minutes on court. Deon took it to Cheyna early, with a commanding 7-0 lead in the first. Cheyna fought back but couldn't close it out, losing the first 11-8. To start the second, there were some short rallies and unforced errors, getting Deon to 5-1 up. Cheyna couldn't get into this one, losing it 11-3. With Deon chasing everything down, and attacking at the right times, she was able to shut Cheyna out in a quick 20 minutes. 3-0 Deon, 11-8, 1-3, 11-2. "Amazed at how good I felt on there. Cheyna is a really nice player but I don't think she really got into the game. I was mixing the ball up well, happy to get it over in three", and now able to rest up for Tuesday's main draw match. Somehow Sam Cornett sat down to ref her second match of the night which was bound to be a battle. Our second 5-gamer of the night was a great way to finish our Final Round of Qualification. With Maria's attacking style and Nele's nice movement, the girls were neck and neck throughout. Nele used her straight forhand drop as a terrific weapon while Maria won many of her points with a straight kill from behind Nele. 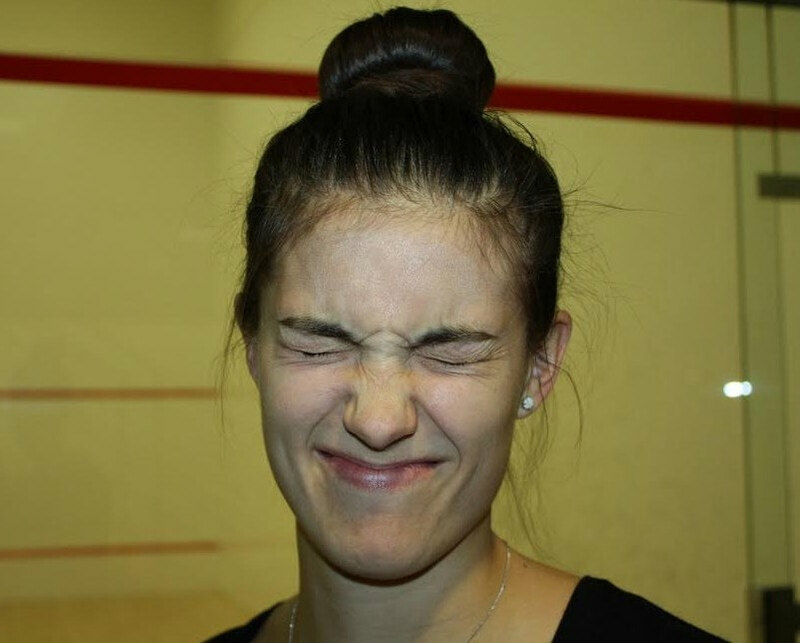 Although the games seemed even, Nele took a 2-0 lead in the match. But Maria wasn't done. She fought hard, seemed to loosen up a bit, and won the next two games to level the score. 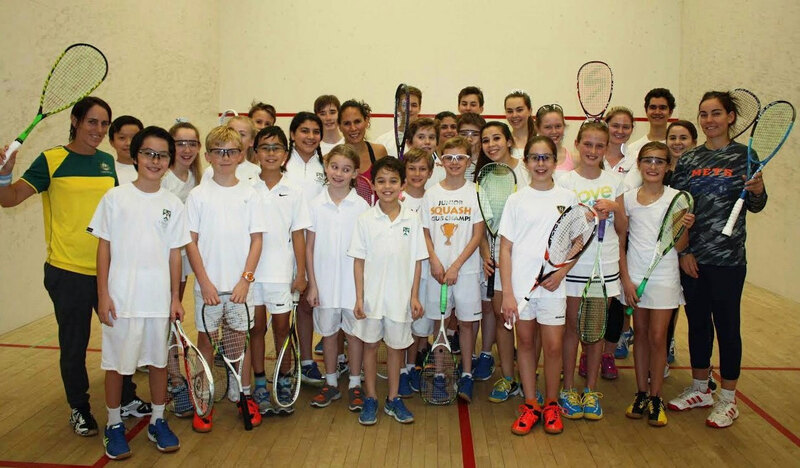 The fifth game was competitive throughout, with Nele pulling away to clinch the match with an 11-8 win. 3-2 Nele, 11-7, 11-8, 9-11, 6-11, 11-8 in another 55 minute nail biter. 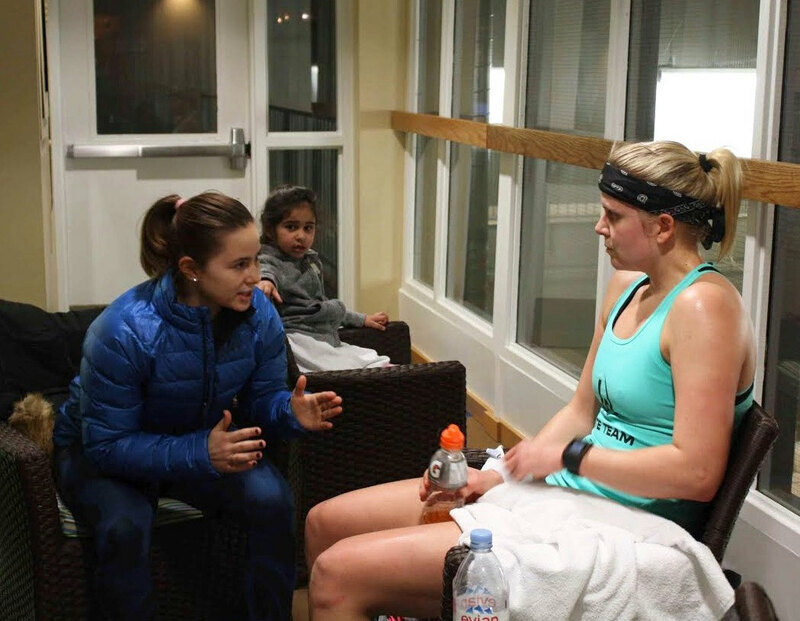 "I knew Maria was going to be a very tough opponent so I prepared myself as well as I could. Super happy to get through in 5 and excited to play tomorrow!!!!" beamed Nele after the match. Matches start at 3pm on Tuesday and run back to back for 8 matches in a row.